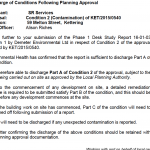 Given the sensitivity of the proposed development and the naturally elevated levels of contamination in the natural soils of the area of the site a contaminated land planing condition was attached to the decision notice for the development. 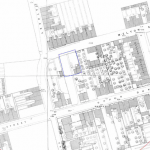 The review of the site history revealed the site was initially occupied by a building that appeared to be a dwelling, which was cleared circa 1900. The site was redeveloped in the 1960’s when a dwelling was erected. The Streetview images revealed the building was a single story dwelling. Aerial plates revealed the dwelling was demolished after 2014. Geological maps did not record any drift deposits to be present on the site, with deposits of alluvium 130m west of the site. The bedrock was recorded to be mudstone with the Northampton Sand Formation in close proximity to the site. The sand formation is impacted by naturally elevated concentrations of metals. A review of radon maps identified the site as being in an are where full radon measures would be required. The sensitivity of the groundwater and surface water receptors were assessed and the sensitivity of both were assessed as being low, discounting them as credible receptors. Data provided by Groundsure and the Environment Agency indicated that there was no credible sources of contamination off site (including landfills) and no historical industrial uses of the site were identified. On completion of the desk based assessment the site walkover survey was undertaken. At the time of the survey the site had been cleared. Three hand held trial pits were excavated and made ground was recorded to be present in two of the three trial pits. Given the potential for elevated levels of contamination in the natural soils, three samples of the natural soils were taken to assess the risks. Whilst the initial results indicted the natural soils were impacted by elevated levels of arsenic and lead, further bioaccessibility testing was undertaken and it was concluded that the natural soils were suitable for the proposed end use. The qualitative risk assessment was undertaken and the made ground on the site, underlying bedrock (radon) and alluvium were all credible potential sources of contamination. 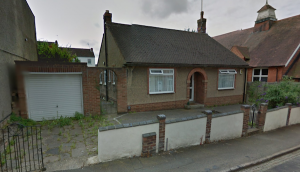 It was concluded that the remediation was a more appropriate approach to site investigation, which comprised of the removal of made gerund from garden and landscaped areas, and the incorporation of radon/gas ground measures in the dwellings. 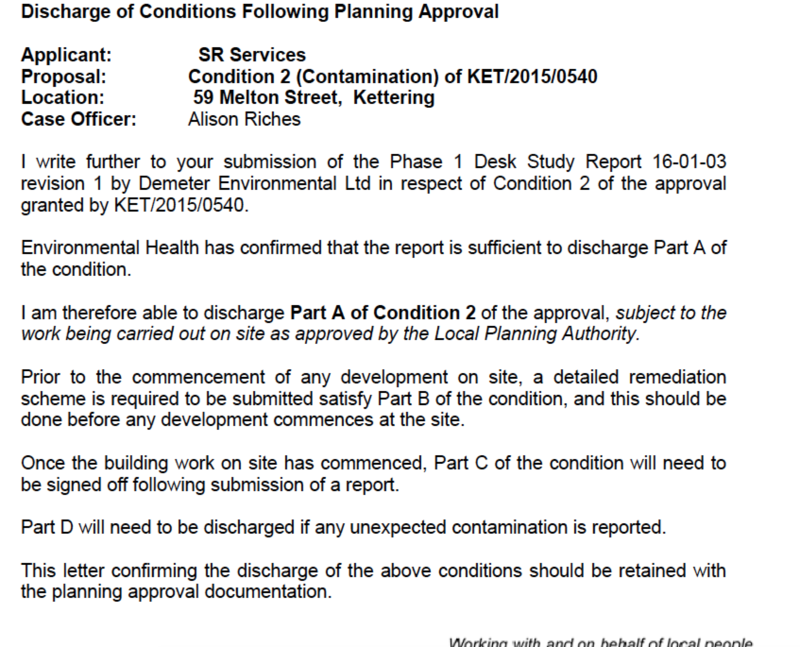 The desk study report was revised to include some details of the proposed remediation, the memo accepting the report is available on the Kettering planning portal. 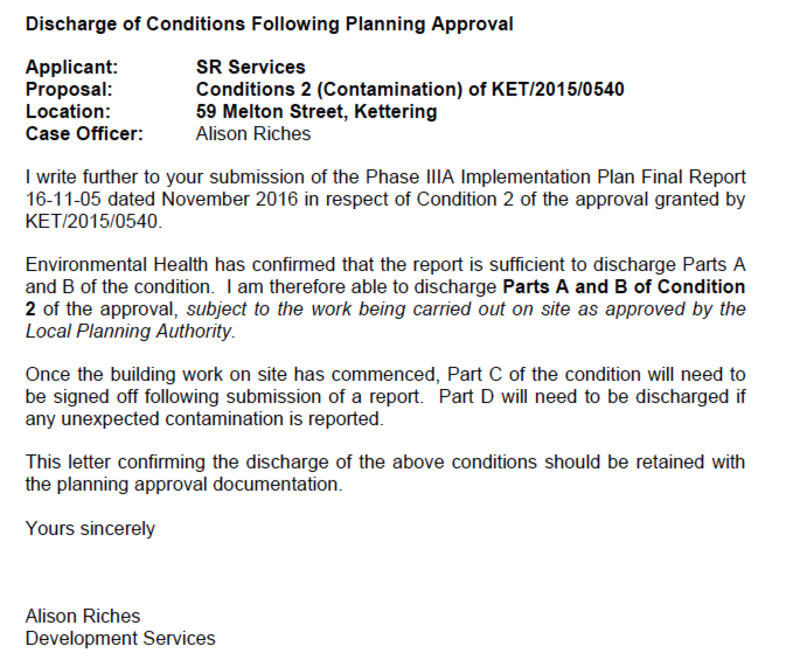 Once the recommendation of the desk study report were accepted the Phase IIIa Implementation Plan was required to to discharge the second part of the contaminated land planning condition prior to the commencement of the development of the site. The plan included details engineering cross-sections of the buildings showing how the gas/radon protection measures will be incorporated into the building design, as well as details of the gas membrane. The plan also contained the methodologies of how the removal of the made ground will be validated as well as details of imported soils and rates of testing. 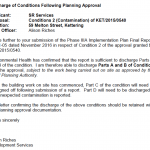 The memo accepting the Implementation Plan is available on the Kettering planning portal.